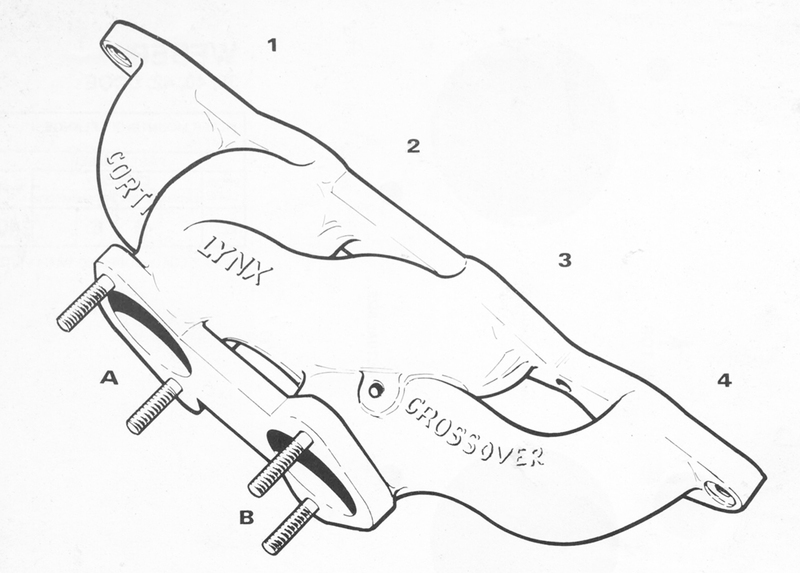 The “Lynx Crossover” is a unique induction manifold, designed to obtain maximum efficiency from a twin choke side-draft carburettor on 4 cylinder 4-port cylinder heads. Conventional manifolds connect venturi A to cylinders 1 and 2, and venturi B to cylinders 3 and 4. When applying either of the two typical four cylinder firing orders, 1 2 4 3 or 1 3 4 2, each venturi feeds 2 consecutively firing cylinders. This results in two induction pulses followed by two static periods. The “Lynx Crossover” manifold is unique in that it connects venturi A to cylinders 2 and 3 and venturi B to cylinders 1 and 4, i.e. to alternatively firing cylinders. The “Crossover” therefore, spaces the induction pulses evenly, separated by static periods. It is in this situation that the side-draft carburettor was designed to operate effectively as with twin side-draft carburettors where each venturi feeds only one cylinder. Testing on engines of most makes and capacities under road and competition conditions has proven the concept of “Lynx Crossover”. Results are improved power, torque and throttle response of both stock induction systems and other single side-draft conversions. Simplicity of tuning is also another outstanding feature. The great efficiency of the “Crossover” enables the fitment of a “larger the stock” carburettor for better performance without an increase in fuel consumption under normal driving conditions. The range of “Lynx Crossover” manifolds covers most popular engines in use throughout the world, and has been widely recognised as a major advancement in the field of performance induction equipment.